Ten years ago this community performed an astonishing feat. Responding strongly to a call to support the performing arts in our area, the citizens and businesses contributed hundreds of thousands of dollars in cash, materials and labor to renovate the Palace Theatre. The outstanding success of this effort led to the complete refurbishment of the building, restoring it to a condition not seen in decades. This allowed two very important organizations to become newly-established in Vinton and the surrounding area. The organization known as Area Community Theatre, Inc. of Benton County (ACT I) found a permanent home after the stage at The Old Creamery Theatre Company in Garrison dimmed the lights for the last time. 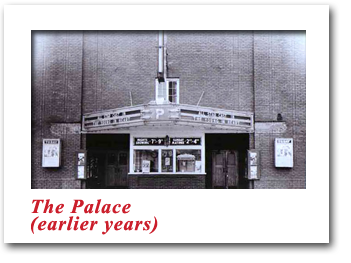 It re-established a year-round movie house in the Palace Theatre, allowing first-run family motion pictures to be shown at a fraction of the cost of other movie outlets in the area. Together, ACT I and The Palace have worked hand in hand to bring you, our patrons, quality entertainment at almost unheard-of prices, working in close cooperation to achieve our common goal. It is a relationship that continues to strengthen with each passing year. This year The Palace and ACT I have combined our efforts to bring customers not only first class entertainment, but also a convenient online ticket reservation system. Even more cooperative ventures are planned for the future. As ACT I celebrates its 30th Anniversary season and The Palace its 10th, both organizations want to take a moment to express our appreciation to you, our patrons, for continuing to support our efforts with the same enthusiasm and dedication that you did during the renovation effort. 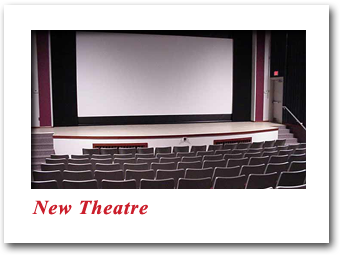 Thanks to you, quality movie and live performance entertainment continues to reach out to the surrounding area. We pledge to continue to work together to strengthen your entertainment dollars even more. The Palace in earlier years. The theater opened October 14, 1915 with silent pictures and live traveling performers. 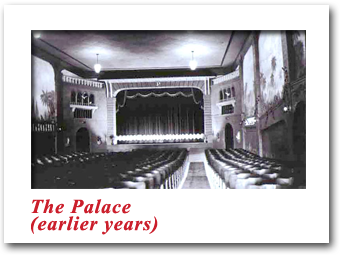 The Palace of bygone days seated 500 people on the main floor and sometimes sold out two showings a night. The lobby was very small, there was no backstage area or balcony seating. The interior of the new theatre can seat 161 people on the main floor and 50 in the balcony. Full service features include a snack bar, state of the art sound and projection system, and accomodations for the hearing impaired and for patrons in wheel chairs.